Chicago teachers plan to rally downtown Thursday against proposed Chicago Public Schools layoffs and millions of dollars in budget cuts. At 4:30 p.m., the Chicago Teachers Union is expected to begin the rally at the Bank of America headquarters in the city’s West Loop and travel to City Hall to take a united stand against the school district. Wednesday night, one teacher from each Chicago public school met with union leadership during the House of Delegates meeting. One day after Chicago Public Schools officials announced $100 million in proposed budget cuts, the Chicago Teachers Union closed its Bank of America account on Wednesday in protest over the controversial interest rate swap agreements held between the bank and school district. CTU says cash-strapped CPS, which is facing a $480 million budget hole this fiscal year, has lost more than $502 million to "predatory" swap deals with financial institutions, including Bank of America. According to the union, Bank of America has collected $77 million in profits off of its interest rate swaps with CPS. "What we hope is that our withdrawal of funds will spark people all over this city, all over this state and all over the country to start withdrawing funds from Bank of America until they give back some of the ill-gotten gains they've made off the backs of our students," CTU Vice President Jesse Sharkey said outside the Bank of America at 135 S. LaSalle St. The union closed its Bank of America account in the amount of $726,000 and moved the funds to Amalgamated Bank, which is not profiting from such swaps, according to the union. CTU officials noted that other municipalities have taken successful legal action against banks to recoup money lost to "toxic" interest rate swaps. Last edited by campbell; 02-04-2016 at 02:20 PM..
A week after temporarily halting a critical borrowing deal, the cash-strapped Chicago Public Schools returned to Wall Street on Wednesday — but paid a huge price for the delay. CPS initially planned to issue $875 million in bonds on Jan. 27, but officials said they put off going to market because some buyers wanted more time to consider the deal. On Wednesday, the amount CPS is borrowing was scaled back dramatically to $725 million. 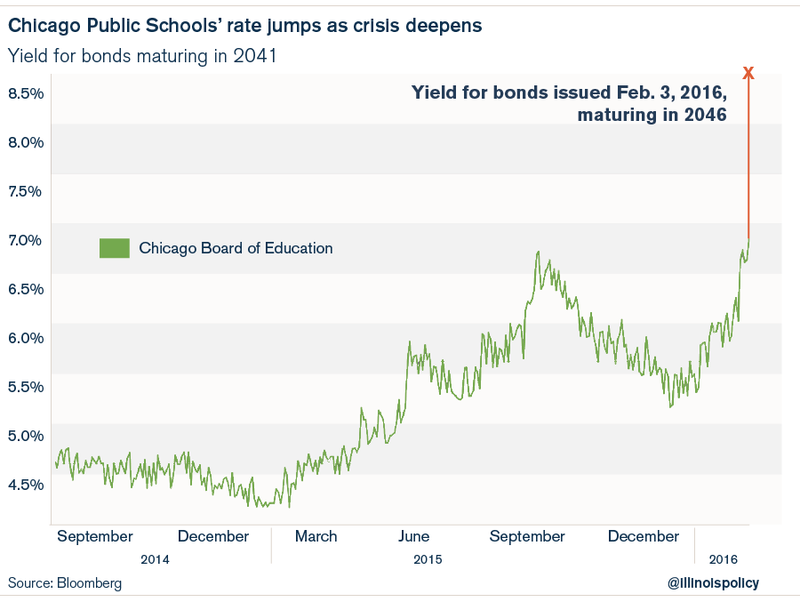 And instead of the 7.75 percent interest rate offered to buyers of the tax-exempt bonds last week, CPS promised them a higher yield of 8.5 percent, sources said. The 8.50% yield on the 28-year bond landed 580 basis points over the Municipal Market Data’s top-rated benchmark for a similar maturity and nearly 500 basis points over a BBB credit. The yield on the 10-year maturity landed 607 basis points over a similar top-rate maturity and 515 basis points over a BBB credit. Fitch Ratings, Standard & Poor’s, and Moody’s Investors Service have the district deep in speculative-grade territory with single-B level ratings. The deal received a BBB rating from Kroll Bond Rating Agency. The preliminary price on the taxable, 17-year maturity, completely axed from this week’s deal, offered a yield of 9.75% with a coupon of 9.50%. About $393 million was to reimburse the district for money already spent. So how much will Kroll lose when they are sued because CPS goes bankrupt? Anything? There's a better chance I'd payoff if I issued the same junk. ETA- CPS wouldn't care if it was priced to yield 20%. They are clearly the winners here. Illinois’s quest to take over Chicago’s schools intensified as Governor Bruce Rauner said the state can block the district from borrowing in the municipal-bond market, a claim the nation’s third-largest school system rejects. The Illinois State Board of Education is investigating the finances of the district, which is facing projected deficits of $1 billion a year through 2020, and the Republican governor is pushing for legislation to strip the city of its control. The system has routinely relied on bond sales to help cover operating costs and push debt payments further off into the future. The Chicago Board of Education is struggling to avert insolvency after years of borrowing, drawing on its reserves and shortchanging the workers’ pension fund, which is causing its annual retirement payment to soar. With a junk credit rating, the board sold $725 million of bonds this month for yields as high as 8.5 percent, more than twice that demanded from most credit-worthy state and local governments. The district said the state doesn’t have the power to keep it from borrowing, as Rauner claimed. If they think this is ugly, wait til they actually default on their bonds. Gov. Bruce Rauner said Monday the Illinois State Board of Education has the ability to block Chicago Public Schools from entering into bad bond deals. And less than an hour later, CPS CEO Forrest Claypool had a simple response: No, they don’t. Rauner made the statement just three weeks after CPS borrowed $725 million by selling bonds carrying an extraordinarily high interest rate of 8.25 percent — and days after his handpicked education leaders announced they’re investigating the finances of the state’s largest district. “I hope that [blocking a bond issue] never becomes necessary, but we’ve got to be ready to take action and step in,” Rauner said. The governor also reiterated that recent comments he made highlighting the ultra-shaky financial footing of CPS were not meant to scare lenders and imperil the school system as a way to further his position that the state should take the reins — an assertion made by Mayor Rahm Emanuel’s administration earlier this month. Rauner also downplayed the state education board’s decision to launch a probe into CPS, claiming that’s also occurring at five other school districts around the state. “We have a duty to evaluate what’s going on in that school district, learn the facts and then decide what’s appropriate action to take,” Rauner said. The move could bolster his effort to have the state take control of CPS. As Chicago Public Schools' money troubles worsen, students and their families face increasing uncertainty. Dozens of classroom staff were laid off last month after the school district cut principals' second-semester budgets. A strike is looming as CPS prepares to slash teacher benefits. But if the school district ever comes up short on its debt payments, the investors who bought CPS' bonds can rest assured they will get what they are owed — straight from Chicago taxpayers. The school district's bond contracts include a little-known provision that would trigger a property tax increase if CPS fails to pay. The county clerk would deliver that additional revenue directly to a bank — much the way a creditor might garnish an individual's wages. Had CPS secured voters' approval before issuing its bonds, the district would have a dedicated stream of property tax revenues available to pay off the debt. But for 20 years Chicago school officials have avoided holding referendums by promising to use an existing revenue source to make debt payments: mainly the per-pupil education funding the district gets from the state. Property taxes serve as a backup. With this type of borrowing, called an alternate revenue bond, the pledged revenue stream usually covers the debt payments and the backup option isn't called upon. Indeed, in a statement responding to Tribune questions, the district noted that "CPS has used alternate bonds since at least 1997 and has never failed to make a debt service payment." But some analysts believe the district's ongoing cash crisis makes that scenario more likely. Last month CPS struggled to scrape together enough money for a $474 million payment on its $6 billion debt load. To come up with the money, the district had to borrow about $200 million — a deal that initially stalled for lack of investors and finally got done less than two weeks before the Feb. 15 due date. To reassure prospective investors, CPS Treasurer Jennie Huang Bennett explained in a January online presentation that if the school district were unable to make a debt payment, "the taxes are then extended and collected for the benefit of bondholders." Note that the district had to pay 8.5% in its last bond offering. Hmmm. It seems bondholders don’t believe Bennett’s preposterous claim, and neither do I. The fact is, bondholders can’t “force a tax increase.” The county clerk can assess the tax, but that tax can be challenged. Since Chicago is a city of landlords, I would expect all kinds of enforceability challenges. Those challenges could drag on for months or even years. Meanwhile the district would be in default. Yields would soar, and so would penalties and taxes to make up for it. There is nothing automatic about payment. Bennett’s claim may very well trigger a lawsuit. It’s certainly a lie. The one-sided Tribune article smacks of something written by the CPS and panicked boldholders, for the sole benefit of the CPS and panicked bondholders. Would mayor Rahm Emanuel really take this all the way through the courts, knowing “victory” would mean massive tax hikes on top of the biggest tax hike in history he passed last October? His comment at the time was “It’s Not a Piece of Art“. Indeed! Would he really pass another hike just to pay off bondholders, with the city getting nothing out of it but more misery? Mayor Rahm Emanuel is using $220 million in “short-term bridge” financing — at a heavy cost to beleaguered Chicago taxpayers — to make a state-mandated payment to police and fire pension funds that’s higher than his tax-laden 2016 budget assumed. Before raising property taxes by $588 million for police and fire pensions and school construction, aldermen eager to bite the bullet and get it over with demanded to know why Emanuel wasn’t proposing an even bigger increase instead of rolling the dice. Aldermen were concerned about Emanuel’s risky assumption that Gov. Bruce Rauner would sign legislation — approved by the Illinois House and Senate, but not yet on the governor’s desk — giving Chicago 15 more years to ramp up to a 90 percent funding level for police and fire pensions. Chicago taxpayers would still be on the hook for $619 million in payments to the two funds this year, more than double the city’s prior payment. But that’s $220 million less than the city would have been forced to pay and an $843 million break over the next five years. The City Council’s questions turned out to be prophetic. Earlier this month, Chief Financial Officer Carole Brown sent a letter to aldermen informing them that Emanuel had used a $220 million “short-term funding bridge” to make the higher police and fire pension payment due on that day. That’s because the police and fire pension bill is caught up in the marathon state budget stalemate, and state law required the city to deposit the difference between current law and Emanuel’s risky assumption by March 1. “This short-term funding bridge will be terminated by the city when Gov. Rauner signs” the bill, Brown wrote. Civic Federation President Laurence Msall called the $220 million borrowing an “unfortunate, expensive, yet forseeable development” Emanuel should have anticipated by putting a “contingency plan” in place. Instead of rolling the dice, Msall said Emanuel should have established a deadline for the governor’s signature on the bill that preceded the Dec. 29 deadline to send the city’s property tax levy to the county clerk. When there was no action by that date, the mayor should have cut expenses or asked the City Council to raise property taxes by an additional $220 million, Msall said.